The Second World War was history's largest and most significant armed conflict. It served as the breeding ground for the modern structure of security and intelligence, and for the postwar balance of power that formed the framework for the Cold War. Weapons, materiel, and actual combat, though vital to the Allies' victory over the Axis, did not alone win the war. To a great extent, victory was forged in the work of British and American intelligence services, who ultimately overcame their foes' efforts. Underlying the war of guns and planes was a war of ideas, images, words, and impressions—intangible artifacts of civilization that yielded enormous tangible impact for the peoples of Europe, east Asia, and other regions of the world. The war pitted some 50 Allied nations, most notable among which were the United States, United Kingdom, Soviet Union, and China, against the Axis nations. The name "Axis," a reference to the straight geographic line between the capital cities of Rome and Berlin, came from a pact signed by Germany and Italy in 1936, to which Japan became a signatory in 1940. Ultimately a number of other nations would, either willingly or unwillingly, throw in their lot with the Axis, but Germany and Japan remained the principal powers in this alliance. Over those six years, armies, navies, air units, guerrilla forces, and clandestine units would fight across millions of square miles of sea and land, from Norway's North Cape to the Solomon Islands, and from Iran to Alaska. The war would include more than a dozen significant theatres in western Europe, the north Atlantic, Italy, eastern and southern Europe, Russia, North Africa, China, southern Asia, Southeast Asia, and the Pacific islands. Less major, but still significant, engagements took place in East Africa, the Middle East, and West Africa. There were even extremely limited engagements—mostly at the level of diplomacy, espionage, or propaganda—in South America and southern Africa. Adolf Hitler and the Nazis killed another 15.5 million in a massive campaign of genocide that included the "Final Solution," whereby some 6 million Jews were killed. Another 3 million Soviet prisoners of war, along with smaller numbers of Gypsies, homosexuals, handicapped persons, political prisoners, and other civilians rounded out the total. Principal among the Nazi executioners was the SS, led by Heinrich Himmler, which operated a network of slave-labor and extermination camps throughout central and eastern Europe. About 14 million civilian deaths have been attributed to the Japanese. They imposed a system of forced labor on the peoples of the region they dubbed the "Greater East Asia Co-Prosperity Sphere," and literally worked millions of civilians and prisoners of war (POWs) to death in their camps. The Japanese also conducted massacres of civilians that rivaled those undertaken by the Nazis in Russia. Soviet non-combat atrocities accounted for another 7 million deaths. Victims included members of deported nationalities, sent eastward to prevent collaboration with the Nazis; murdered German POWs; returning Soviet POWs killed because of their exposure to the West; and other campaigns of genocide conducted by Soviet dictator Josef Stalin. ushered in an era in which Europe, heavily aided in its recovery by the United States so as to avoid another European war, became a major economic power. The war transformed the United States from an isolationist giant, with little interest in affairs outside the Western Hemisphere, to a modern superpower. Symbolic of this transformation was the construction of the Pentagon building, commenced just before the United States entered the war. The war also marked the birth of the modern U.S. intelligence apparatus, of which the Office of Strategic Services (OSS), led by Major General William Donovan, was the progenitor. OSS would cease to function soon after the war's conclusion, but two years later, it would be replaced by a far more lasting organization, the Central Intelligence Agency (CIA). Despite the wartime alliance with the Soviet Union, and the creation of the United Nations in an effort to settle international differences peacefully, the Cold War was an all but inevitable result of the war, which left only two superpowers in its wake. Thenceforth, the world would be divided between the United States and its allies—among which would be its two wartime enemies, West Germany and Japan—and the Soviet Union and its affiliates. These would include East Germany and eastern Europe; Communist China from 1949 to the Sino-Soviet rift of the late 1950s; and a number of states in the gradually emerging developing world of the Middle East, Africa, and Asia. The conflict spelled an end to the European colonial empires, and brought independence to dozens of countries in the Middle East, Africa, and south and east Asia. Among the many states that owed their existence to the war was Israel. The effects of the Holocaust moved Western leaders to action, and Western sympathy helped ensure support for the establishment of a Jewish state. The victory of Benito Mussolini's Black Shirts in Italy in October 1922, introduced the world to Fascism, which reinterpreted nationalism in totalitarian terms, i.e., as an all-encompassing political movement intended to supplant all other centers of influence, such as religion, in the life of the individual. Hitler regarded Mussolini as a mentor, yet the Nazis would eclipse the Fascists in terms of strength, influence, and impact on world history. Not only was Germany's militarily more powerful than Italy's, but the agenda of the Nazis, who took power in January 1933, had a much greater sense of urgency. Central to Hitler's plans, outlined in his manifesto Mein Kampf (1924), was the elimination of central and eastern European Jews, who Hitler regarded as the principal barrier to German European dominance. Intimately tied with this plan was his vision of conquest and colonization in Russia and eastern Europe, which would—after the Jews and Slavs had been exterminated—constitute a German empire or reich that Hitler predicted would last a thousand years. This consciously millenarian vision drew on German history and national mythology, citing as the first and second reichs the Holy Roman Empire of the Middle Ages and the German Empire of 1870–1918 respectively. It appealed not only to longstanding strains of anti-Semitism in Europe, which dated back at least to the time of Crusades, but also to disaffection with what the Germans regarded as their betrayal and humiliation in World War I and with the Versailles Treaty of 1919. In a country that had recently been devastated by inflation—Germany's economic crisis preceded the worldwide Great Depression by several years, and was even more severe—Nazism seemed to offer a solution for strengthening a once-great nation that had fallen on difficult times. Communism and the Spanish Civil War. At a rhetorical and symbolic level, Hitler opposed Communism, and used the threat of Soviet Russia as justification for his moves to arm Germany in the 1930s. In reality, the Nazis and Soviets provided one another with mutual assistance, continuing a pattern begun in World War I, when imperial Germany had aided V. I. Lenin. After the war, German aristocrats, nationalists, and Communists all opposed, and helped bring down, the liberal democratic Weimar Republic. Though Hitler killed thousands of Communists after he gained power in January 1933, German military forces trained in Russia, and Germany provided Russia with equipment. This secret relationship would become public when the two sides signed the Non-Aggression Pact on August 23, 1939, but until that time, Hitler and Stalin made much of their putative opposition to one another. The Spanish Civil War (1936–39) provided them with a proxy battleground, as Germany and Italy tried out new armaments in support of the Nationalists, led by Francisco Franco. The Republican side turned to Stalin for help, but he gave them little assistance while siphoning resources and leaders, some of whom went to Moscow and never returned. On the other hand, the romance and mythology of the Republican cause provided the Soviets with a propaganda victory that comported well with their current "Popular Front" strategy. In accordance with the latter, Communists worldwide ceased calls for world revolution, and instead formed alliances with liberal, socialist, and anarchist movements. Later, Stalin would form a "popular front" on a grand scale, as he aligned himself with the United States and Great Britain. Munich and Mussolini. Hitler's rhetorical opposition to Communism won him tacit support from Britain and France, which in the 1930s regarded Nazism as the lesser of two evils. At Munich in September 1938, British and French complicity yielded Germany title to a portion of Czechoslovakia known as the Sudetenland. In the view of many historians, the Munich conference and the appeasement efforts of British Prime Minister Neville Chamberlain rendered war all but inevitable. Munich also sealed the relationship between Mussolini and Hitler. Despite their later alliance, Mussolini, a former Communist, rightly perceived significant differences between his nationalism and Hitler's racism. If Britain and France perceived Hitler as a buffer against Stalin, then Mussolini in the early 1930s seemed like a buffer against Hitler. What brought Italy and Germany together was the same complex of factors that eventually forged a three-way alliance with Japan: a shared desire for greater power, territorial ambitions that had supposedly been frustrated by the democratic powers, and a string of diplomatic and military successes that encouraged ever bolder moves. Japan, militarism, and expansionism. When its troops marched into Manchuria in 1931, Japan launched the first in the series of conquests and invasions during the 1930s that set the stage for the war. Though nominally led by an emperor, Hirohito, by that time the nation had come under the control of military officers, who had imposed a dictatorship. The Japanese lacked a single powerful leader until Hideki Tojo emerged at the top in 1941. Although certainly authoritarian and strictly controlled, the Japanese system was technically not totalitarian, in the sense that it did not have a specific, animating modern ideology. Instead, it relied on ancient national myths, combined with an abiding sense that Japan had been wronged in its struggle to make a place for itself as a world power. The Japanese belief system combined nationalistic and racial themes: like the Nazis, they regarded all other peoples as inferior. This would have seemingly made the Japanese and Nazi systems mutually exclusive, but because they were at opposite sides of the world, it provided a convenient formula for dividing the planet between them. Each of the three future participants in the Axis Pact set out to test the resolve of the other powers to oppose them, and found such opposition all but nonexistent. The League of Nations, formed to put an end to wars after World War I, failed to act decisively when Italy conquered Ethiopia in 1935–36, when Germany occupied the Rhineland in 1936, when Japan conquered most of eastern China in 1937–38, or when Germany annexed Austria in 1938. 1939–41: The Axis triumphant. Over the course of the first nine months of 1939, Germany added the rest of Czechoslovakia, while Italy occupied Albania. Having signed the Non-Aggression Pact with Stalin in August, Hitler invaded Poland on September 1. Britain and France, which on March 29 had pledged to support Poland, declared war, but did not attack Germany. During the next few weeks, Germany and Russia divided Poland between themselves, and in November, the Soviet Union launched a separate war with Finland. Although the Soviets eventually emerged victorious in March 1940, the Russo-Finnish War convinced Hitler of Stalin's vulnerability. Stalin had decimated his officer corps with his purges in the 1930s, and his collectivization efforts had been accompanied by the imprisonment, starvation, and deaths of millions. The Soviet Union was to prove much stronger, however, than Hitler imagined. And if Hitler believed that Japan would join him in making war on the Soviets, he was mistaken; the Soviet performance against the Japanese during the little-known tank battle at Nomonhan in Manchuria in August, 1939, effectively convinced the Japanese of Russia's true strength. From 1939 to 1941, the Axis unquestionably had the upper hand in the conflict. During the first part of this period, nicknamed "the Phony War," hardly a shot was fired in western Europe. Only in the spring of 1940 did Hitler's forces resume action, conquering Denmark, Norway, the Low Countries, and France. The French, who relied on the defenses of the Maginot Line (designed to fight a World War I–style conflict of limited movement), surrendered after a nominal resistance effort. Most of the country fell under direct Nazi control, which a small portion to the southeast, with the town of Vichy as its capital, formed a pro-Axis government. The speedy capitulation of the French left the British alone in opposition to the Nazis. In May 1940, Chamberlain resigned, and was replaced by Winston Churchill. In this change, the British people gained an unexpected advantage; over the next five years, Churchill, widely regarded as one of history's great orators, would stir his people to action with a series of memorable speeches. Yet, the position of the British was perilous, and as the Nazi Luftwaffe launched an aerial campaign against them in August, it seemed that German victory was only a matter of time. Axis victories and blunders. At about the same time that the Battle of Britain began, Mussolini attacked the British in North and East Africa. He thus unexpectedly offered England a venue for fighting the Axis outside of Europe, and eventually German forces would be diverted into the Africa campaign. In southern Europe, Hitler managed to compel Bulgaria, Hungary, and Romania into joining the Axis, but this advantage was overshadowed by another diversion of forces caused by Mussolini. Mussolini invaded Greece in October 1940, and Greek resistance proved so fierce that in April 1941, German forces rolled into southern Europe. Churchill attempted to oppose them in Greece, but the Germans pushed back British forces, and in history's first airborne invasion, took the isle of Crete—an important Mediterranean base—in May. By mid-1941, virtually all of Western Europe, except Britain and neutral Switzerland, Spain, and Sweden, belonged to the Axis. But the Balkan campaign had pushed back Hitler's timetable for the most important campaign of the war, the invasion of Russia. The purpose of all other fighting up to that point had been to eliminate opposition as Germany invaded the Soviet Union, and rather than conquer Britain, Hitler preferred to enlist it as an ally against Stalin. He called off attacks on British air bases in May 1941, but by then the Nazi bombardment had inflamed British sentiment against Germany. On June 22, 1941, the Nazis invaded Russia. Operation Barbarossa, as it was called—its name a reference to the twelfth century Holy Roman Emperor Frederick I Barbarossa—was the largest land invasion in history. Fought according to the blitzkrieg ("lightning war") tactics already demonstrated elsewhere in Europe, the invasion relied on mechanized infantry divisions and Panzer (tank) columns with heavy aerial support. The invasion would initially yield enormous victories for the Nazis, who quickly doubled the size of their territory by annexing most of western Russia. However, the Germans had started the invasion relatively late in the year and were eventually delayed in their advances, given the challenges posed by the Russian winter. This delay was partly due to the incursion into southern Europe, but also resulted from arguments between Hitler and his general staff, which put off the invasion for several weeks. Not content to be Germany's Führer or supreme leader, Hitler also wished to be generalissimo, and eventually he would push aside all military planners and take personal control of the war effort. Not only did Hitler, a corporal in World War I, lack the generals' understanding of strategy, but he tended to be bold where prudence counseled caution, and vice versa. When he had a good chance of taking Britain, he demurred, but a year later, he swept into Russia without taking adequate stock of the consequences. German troops were not equipped with clothing for the winter. This was in part a consequence of the fact that Hitler resisted apprising his armies or his people of the sacrifices necessary for war. Whereas the Allies immediately undertook rationing efforts, Hitler was slow to enact rationing for fear of unleashing discontent. Likewise, he was ill-inclined to equip his men for a long campaign, and thus admit that such a campaign likely awaited them. America enters the war. Japan launched its first major offensive of the war in early December 1941, when, in addition to attacking the United States at Pearl Harbor, it swept into the Philippines, Malaya, Thailand, and Burma. The result of these decisive attacks, combined with German victories in Russia, was to bring the Axis to the height of its powers in 1942. At that point, it seemed possible that the two major Axis powers, taking advantage of anti-British unrest in Iran and India, might even link up, thus controlling a swath of land and sea from Normandy to the Solomon Islands. In actuality, events of 1941 would serve to bring an end to Axis hopes of world conquest. While the invasion of Russia would ultimately cripple the German Wehrmacht, or army, the introduction of the United States to the war would give the Allied force a seemingly bottomless supply of equipment with which to wage the war. It also brought in a vast military force that, alongside the British, would drive back the Germans in North Africa (despite impressive resistance by the tank commander German Erwin Rommel) and make two key landings on the European continent, in Italy and France. Thus, the attack on Pearl Harbor, intended as a first strike to eliminate American opposition, would prove a miscalculation on a par with Hitler's invasion of Russia. Hitler welcomed the Japanese surprise attack on Pearl Harbor at the time, and quickly declared war on the United States, thus, giving him justification for sinking U.S. ships crossing the north Atlantic in order to deliver supplies to Britain. This proved a benefit to President Franklin D. Roosevelt, who, up to then, had been confronted by strong isolationist opposition to war with Germany. 1943–45: The Allies victorious. Unlike the Axis, the Allies were not bound by one single formal alliance. Instead, there were agreements such as Lend-Lease, whereby the United States provided equipment to Great Britain even before it entered the war. Later, America would extend Lend-Lease to the Soviet Union, providing considerable assistance to its future Cold War enemy. To a much smaller extent, the United States and United Kingdom made common cause with the Chinese Nationalists, led by Chiang Kai-shek, and the Free French under General Charles de Gaulle. In neither case did these leaders speak for their entire nations. Chiang's Nationalists expended greater resources on fighting the Communists, led by Mao Tse-tung, than they did against the Japanese invaders. The Communists, who enjoyed widespread peasant support, proved able defenders, and though they would become enemies of the United States, at the time America regarded them as a useful ally against the Japanese. As for de Gaulle, who operated from London, he represented only a tiny portion of France, most of which made little effort to resist Nazi and Vichy rule. Driving back the Axis in Europe. In Russia, the Germans got as far as the suburbs of Moscow before the winter—along with the resurgent Red Army and a defiant populace—caught up with them. Lengthy sieges at Stalingrad and Leningrad (the latter lasting more than 800 days) would spell an end to German hopes of conquest. Led by Georgi Zhukov, the Red Army gradually drove back the Germans and began the long, steady push into central Europe. After defeating the Germans in North Africa in late 1942, the Allies invaded Sicily in July 1943, and Italy itself on September 9. This forced Mussolini to retreat to northern Italy, where he would serve as puppet ruler of a Nazi-controlled state for the remaining two years of his life. On June 6, 1944, an Allied force of some 2,700 ships and 176,000 U.S., British, Canadian, and other troops landed at Normandy, in the largest amphibious invasion in history. By the end of 1944, Allied victory in Europe began to seem all but imminent, but a number of obstacles still stood in the way. Hitler's scientists had developed the V2 rocket, precursor of modern missiles, and Germany fired several of them against England. The Allies, meanwhile, relentlessly bombed German cities, bringing the Reich to its knees. The Battle of the Bulge in the Ardennes forest in December 1944 was the later major Axis offensive in Europe. With the Soviets surrounding Berlin, Hitler on April 30, 1945, committed suicide in his bunker with his mistress, Eva Braun, along with propaganda minister Josef Goebbels and Goebbels's family. 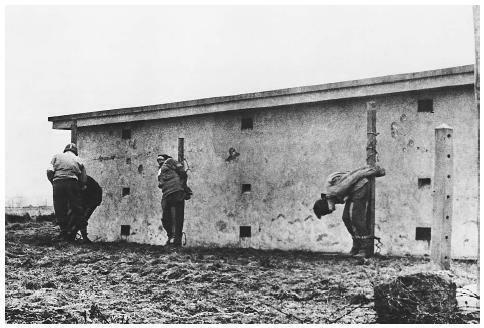 Two days earlier, Mussolini and his mistress, captured by Italian resistance fighters, had been shot. The Germans surrendered to the Allies on May 7. Only after the surrender did the full magnitude of the Holocaust become apparent, and for this and other crimes, those German military and political leaders who did not commit suicide would be tried before the World Court. The defeat of Japan. In the carrier-dominated Battle of the Coral Sea in May 1942, the first naval battle in which opposing ships never caught sight of one another, neither side gained a clear victory, but the Allies won the upper hand at the Battle of Midway the following month. Later that summer, the U.S. Marines fought the Japanese at Guadalcanal in the Solomon Islands, one of the bloodiest battles of the war. Late in 1943, the Marines began a series of assaults on Pacific islands, including the Gilbert, Marshall, Caroline, and Mariana chains. Allied forces under General Douglas MacArthur liberated the Philippines in the fall of 1944. Early in 1945, Allied forces under Major General Curtis LeMay began dropping incendiary bombs on Japanese cities, while the Marines took the nearby islands of Iwo Jima and Okinawa. Still, the Japanese resisted, and Allied leaders contemplated a land invasion, to begin in November. The invasion, they calculated, would cost as many as 1 million American lives, with untold casualties on the among the Japanese. Instead of invading Japan, the United States unleashed the results of the Manhattan Project, which it had begun secretly 1942. Before dropping the atomic bomb, the Allies issued one more plea for the Japanese to surrender, and when they did not, the American B-29 bomber Enola Gay dropped a bomb on the city of Hiroshima. Despite the devastation wrought by this, the first use of a nuclear weapon in warfare, the Japanese still refused to surrender. On August 9, the United States dropped a second bomb, this one on Nagasaki. At this point, Hirohito urged the nation's leaders to surrender. Tojo and several others committed suicide, and on September 2, 1945, Japanese representatives formally surrendered. The Manhattan Project was the most dramatic expression of a theme that ran through the entire conflict, that ideas and information often contribute as much to a successful military effort as do troops and weapons. Though the First World War brought airplanes into widespread use, along with tanks, and resulted in the popularization of radio soon afterward, the Second World War saw the first true marriage of science and defense to yield the military-industrial complex familiar today. Its legacy is evident in the many technological innovations that were either introduced during its course, or very soon after the fighting ended. In addition to nuclear power and the missile, these include radar, computers, jet engines, and television. The war also introduced modern concepts of covert and special operations, on the part of the OSS, the British Special Operations Executive (SOE), military intelligence units, and special warfare units that included the Rangers and the precursors to the Navy SEALS of today. The Germans had their spies as well, some of whom even managed to infiltrate the United States, but their efforts in this regard were never as successful as those of the Allies. Cryptology. In the cryptologic war, the Allies were the unquestioned victors. Perhaps the single greatest intelligence success of the war was the British deciphering of the Germans' secret system of communications. Early in the war, British and Polish intelligence officers obtained a German Enigma cipher machine, to which a team of mathematicians at Bletchley Park applied their expertise. The result was Ultra, the British system for reading the German ciphers. Thanks to Ultra, the British knew many of the targets in advance during the Battle of Britain. In north Africa in 1942, Ultra helped Field Marshal Bernard Montgomery predict Rommel's actions. So vital was the Ultra secret that the British used it with the utmost of caution, careful not to act to often or too quickly on information it revealed for fear that this might tip off the Germans. Only in the 1970s did the world learn of the Ultra secret. American successes included the breaking of the Japanese RED cipher by the U.S. Navy, and the PURPLE cipher by the U.S. Army Signal Intelligence Service prior to the war. During the war, the navy proved more successful at breaking the ciphers of its counterpart than did the army. Also notable was the American use of codetalkers transmitting enciphered messages in the Navajo Indian language, which made their transmissions indecipherable to the Japanese. Neither the Japanese nor the Germans scored any major cryptologic victory against the Allies. Deception, secrets, and covert operations. The Allied invasion of Italy was accompanied by a number of behind-thescenes moves. Just before the invasion of Sicily, British naval intelligence obtained the body of a man who had recently died, and arranged for his body—clad in the uniform of a major in the Royal Marines—to wash up on a shore in Spain. On his person were documents laying out a British plan for an imminent invasion of the Balkans, information the British knew the Germans (who had numerous agents in Spain) would acquire. The ruse, known as Operation Mincemeat (subject of the 1953 film The Man Who Never Was ) left the Germans unprepared for the subsequent invasion. The surrender of most of Italy by Marshal Pietro Badoglio appears to have been the result of behind-thescenes talks with the Allies. During the moments of turmoil in the capital as Mussolini's government was over-thrown, a British intelligence officer provided Badoglio with a safe haven. In 1945, Allen Dulles—future director of the CIA—secretly negotiated with SS General Karl Wolff for the surrender of all German forces in Italy. The Normandy deception included the creation an entire unit, the First U.S. Army Group (FUSAG), from thin air. FUSAG, which was supposed to be landing at Calais rather than Normandy, had a putative commander in General George S. Patton, fresh from victories in North Africa and Italy. Large tent encampments created the illusion of massive troop strength, while fake tanks, landing craft, and other equipment gave indications that the Allies were gearing up for a major operation. So, too, did radio communications from Patton's headquarters, as well as a heavy Allied bombing campaign over Calais in the days leading up to June 6. The ploy succeed in diverting 19 German divisions from Normandy. The race to develop an atomic bomb involved several covert operations, including British sabotage directed against Nazi weapons materials in Norway, as well as an intelligence-gathering operation known as Alsos. The name was chosen by Major General Leslie Groves, who oversaw the Manhattan Project, because alsos is Greek for "grove." Members of the Alsos team, which included both U.S. Army and Navy personnel, scoured research laboratories in Germany, Italy, France, and Belgium for information on Axis bomb-making efforts. Films by Leni Riefenstahl in the 1930s romanticized the myth of Aryan superiority, while cruder propaganda from Goebbels' office excited hatred toward Jews. During the war, Axis powers on both sides of the world made considerable use of radio through broadcasters such as Lord Haw Haw (a.k.a. William Joyce), Axis Sally (Mildred Gillars, an American), and a number of Asian females collectively dubbed "Tokyo Rose" by U.S. forces. 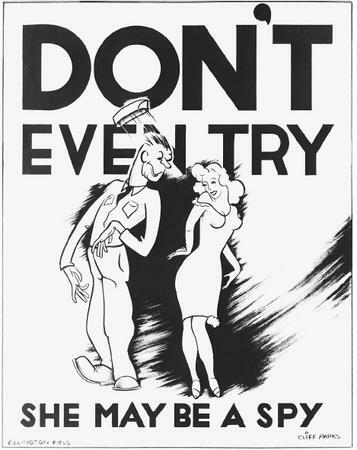 The Allies conducted a propaganda war of their own, through radio broadcasts and the efforts of the U.S. Office of War Information and the Voice of America. Breuer, William B. Undercover Tales of World War II. New York: J. Wiley, 1999. Farago, Ladislas. The Game of the Foxes: The Untold Story of German Espionage in the United States and Great Britain during World War II. City: Publisher, 1971. Shirer, William. The Rise and Fall of the Third Reich. New York: Simon and Schuster, 1960.